I forgot to wear red to Church today. It was Pentecost Sunday; a Sunday 50 days after Easter, when 120 Disciples gathered and were filled with the fiery power of the Holy Spirit. In honor of that flame, we wear red on this Sunday. I could blame my lack of recall on the very busy week I have had. It was truly Health Innovation Week DC and every day was filled with activity. And during most of that week I wore red. I wore a red jacket to be precise. I wore my Walker’s jacket: Little Miss A-type Personality. Perhaps, I forgot to wear red, because I had already been celebrating the power of the spirit within us. You see on Tuesday night something holy happened at the Kaiser Permanente Center for Total Health. A space that is a shrine to technology and the power of electronic communication became a Gallery and the art walked. 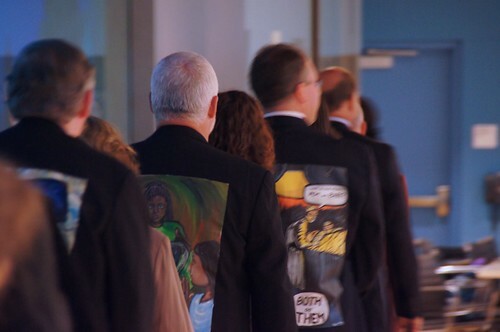 Over 50 people walked around that space wearing patient stories on their backs. They came to get their jackets and tell their tale, but I saw something amazing happen. They became their story. I saw Doctors throw aside being defined by their profession. I saw administrators and government employees drop their distancing titles and simply be the patient that they are. I saw teachers talk with CEO’s and artists meet programmers, and all were connected through their stories. Time and time again, Walkers would come to me and ask me how did I know? How did I know elements of their story that they had not told me? How did I know their personal struggle to balance advocacy and the demands of their life? How did I know the exact scene that Near Miss Mom suffered through as she almost bled to Death after childbirth? How did I paint her so realistically without ever seeing her? Why was I determined to paint Susannah Fox surrounded by Japanese screens? I have never seen her office. I had no idea she daily sifts data in a room decorated with Japanese screens. In every blog post and tweet I have read about the impressions of the Walking Gallery, I hear the same things again and again. It was electric, passionate, fiery and so very filled with positive energy. We were filled with the spirit of change. For many years we were a small group of disciples following a few leaders. 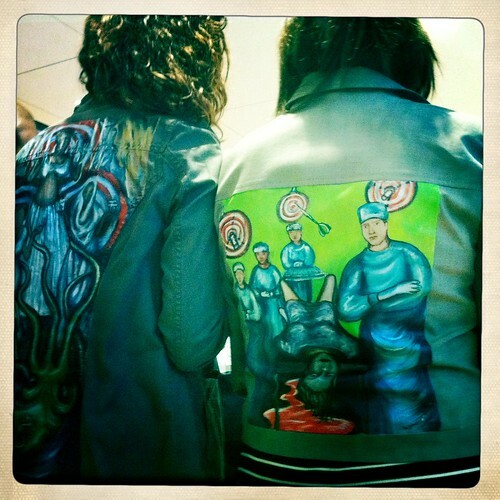 But The Walking Gallery was a day we became a movement. We now will walk and spread the message. 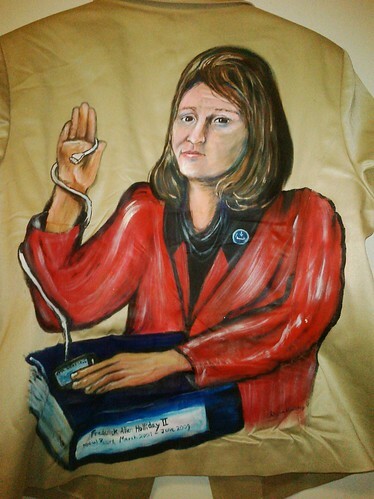 I came away so inspired I painted another Jacket, this is Oath of Office. 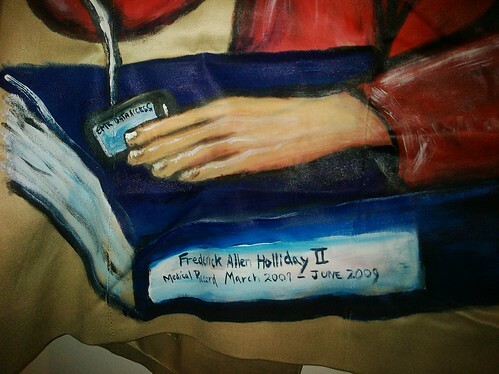 In this painting, I am wearing my red jacket, but now I am swearing an oath. I hold up my right hand. This hand is entwined with a USB cord. That cord loops down around my arm into a smart phone that says, “EMR Data Access.” My left hand is placed upon the Bible of Fred’s medical care. This is the binder of data that I fought so hard for. This is the binder I carried with me everywhere for two months. This is the binder that helped extend Fred’s life. 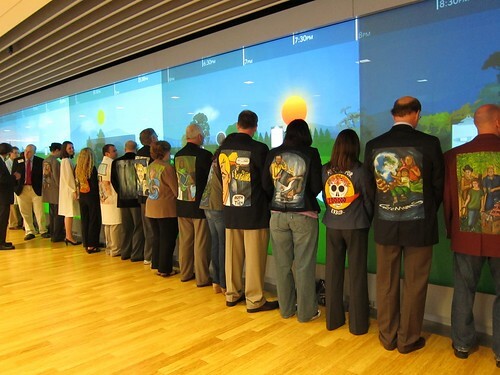 Here I swear to walk the walk as member of the Walking Gallery. What is the Walker’s Oath? Night gathers, and now my watch begins. It shall not end until my death. I shall take no wife, hold no lands, father no children. I shall wear no crowns and win no glory. I shall live and die at my post. I am the sword in the darkness. I am the watcher on the walls. I am the fire that burns against the cold, the light that brings the dawn, the horn that wakes the sleepers, the shield that guards the realms of men. I pledge my life and honor to the Night's Watch, for this night and all the nights to come. Game of Thrones, George R.R. Martin. I think those oaths sum up a lot of the power and duty of a Walker from the Walking Gallery. But feel free to say whatever oath comes to your mind, as you swear to wear this jacket from this day forward, as you swear to take a tragedy and turn it into a thing of beauty. Sometimes there are things that happen in this life that are great and tragic. Sometimes we carry those events on our back for the rest of our lives. And sometimes they bring us closer to God and to a greater communion with all of humanity. I want to thank the brave ones who Walk the Walk with Me. 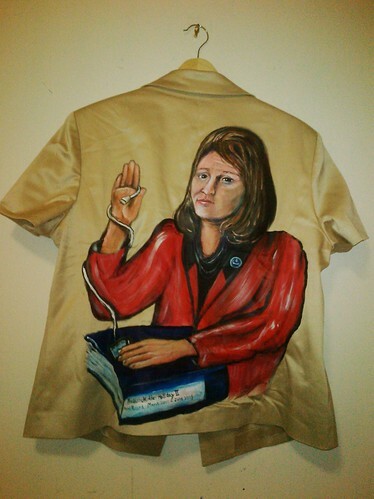 I know I shall be honored to wear my jacket and tell our story, for this night and all nights to come as a member of The Walking Gallery. Thanks Regina for communicating to all those who have not attended the Spirit of The Walking Gallery. In the Greek Orthodox Church, after the Pentecost Sunday, we celebrate today the Holy Spirit Day. Is that a coincidence that you posted today? My oath is to tell my jacket's story to all who ask and to tell it to at least one person who *didn't* ask. I'd estimate that 10 people asked me about my jacket at the Health Data Initiative event at the National Institutes of Health last week. It was a wonderful way to meet new people and to spark new conversations. Alex Drane, who was part of the conversation, described how Fred used Facebook to log his symptoms. She told about your observation, Regina, that if his status updates were incorporated as part of a medical record, his cancer may have been recognized earlier. I was very happy that I had picked up one of the bookmark-size slips of paper with your contact information & jacket QR code on it. I handed it to Tim and realized that I should have more of those - my jacket needs its own business cards!